However, a failed attempt at raw brownies yesterday pretty much meant I had to re-attempt the recipe the next day. They had potential, but I wasn’t happy with the cocoa powder I used (it was Dutch-processed and too dark, ie Valrhona!) and I had to substitute pecans for the walnuts. I just didn’t like the brownies, and they left my mouth and tongue with a powdery feeling that wasn’t very pleasing. I decided to try a different recipe, so I turned to Minimalist Baker’s 5-minute espresso walnut brownies. They looked absolutely delicious. And you know what? They taste awesome! You may have noticed, especially if you’ve been following me on Instagram, that I’ve had a thing for raw (or in my case, no-bake) recipes lately. I can’t officially call them “raw”, even if the original recipe is “raw”, because I’m not using officially “raw” ingredients. For example, in the case of these brownies, I just bought a bag of walnuts from the grocery store. They weren’t roasted or anything, but I still don’t think they’re officially raw. I haven’t jumped on the “raw” bandwagon as of yet, but the recipes are healthier and so much more easier and delicious than I ever imagined. This recipe is perfect for vegetarians and vegans, and is also gluten-free, refined sugar-free and dairy-free. And if you’re just looking to eat healthier, definitely give this recipe a go. It’s the best alternative to the real thing! 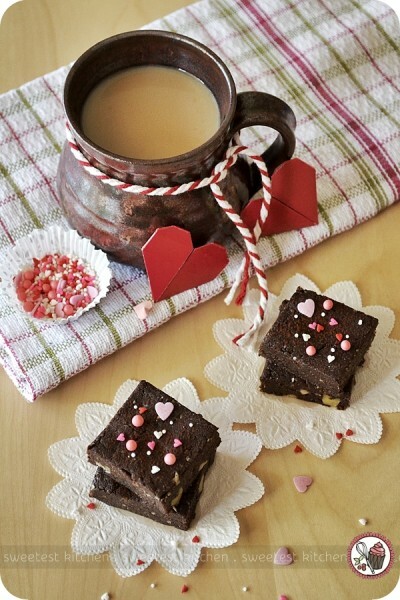 These brownies, while they do require a rather large amount of ingredients, can be prepared in almost 5 minutes flat (I’d say 10 minutes, tops), just as the title of the recipe suggests. No baking necessary! I substituted almond meal for the chopped almonds in the recipe, as I knew this would result in a smoother texture. I also used non-Dutch-processed cocoa powder, which eliminated that powdery feeling I experienced after my first go with raw brownies using a different recipe. I didn’t use a pan to press the brownies into, but instead just shaped the mixture into a square on a piece of baking paper. I didn’t measure it, but it was probably between 6 and 7 inches square. What I’ve also found is that you really need to press the mixture together firmly and tightly, otherwise the slices of brownies that you cut will crumble. The original recipe would have you transferring mixtures from food processor to bowl a couple of different times (transfer nut mixture to a bowl, process the dates, put them in a bowl, add the nut mixture back to the processor, then add dates one a time), but I skipped all that to make it less time-consuming and also to save on washing up; I had already chopped the dates in half when I removed the pits, so I just simply threw them down the chute one at a time after processing the nut/cocoa mixture. 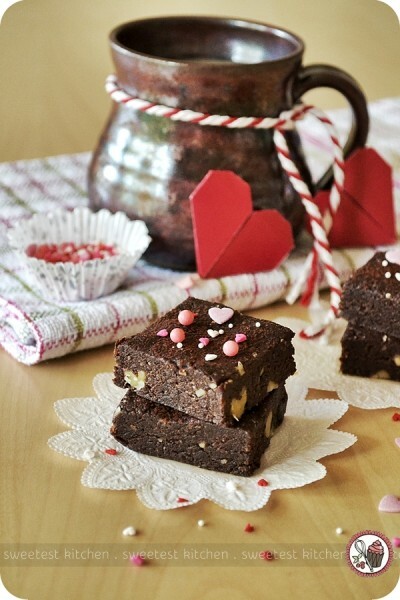 Since it’s Valentine’s Day, I decided that these healthy guilt-free brownies would be my chocolaty sweet treats for today! How sweet do they look! This would be a perfect (and quick!) 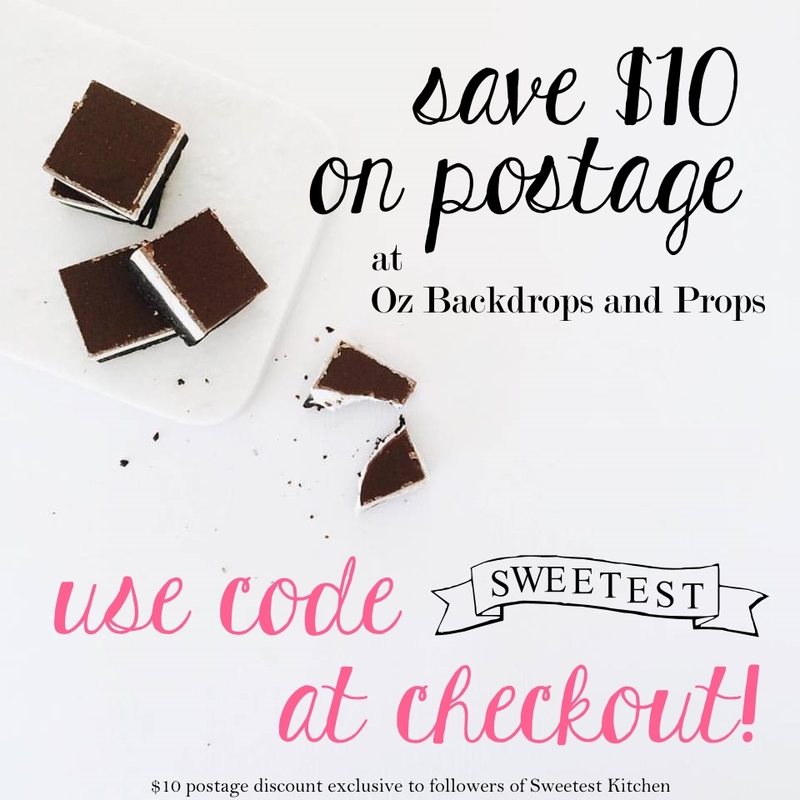 treat for any Valentine’s Day gift as you know that what you’re giving your special Valentine is super healthy! If you follow the original recipe and use all raw ingredients, it’d be even healthier! They are so delicious that it feels like I’m being naughty by even eating just one slice. 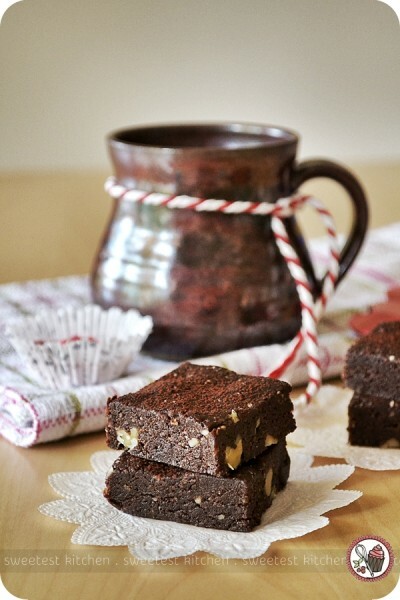 I have to keep reminding myself that it’s okay to indulge in another slice – these brownies are not full of sugar, butter, oil, eggs and flour; they’re full of good stuff! You won't find any butter, oil, eggs, sugar or flour in these brownies, but they're so delicious and fudgy that you won't believe they're actually good for you! Place 1 cup walnuts and almond meal (or chopped almonds) in food processor and process until finely ground. Add the cocoa powder, espresso powder and sea salt. Pulse to combine. Add the dates to the food processor one at a time, letting each date combine into the mixture before adding the next. Process until a dough consistency is achieved, adding more dates if the mixture does not hold together when squeezed in your hand. Chop the remaining ½ cup walnuts and add them to the brownie mixture and toss to combine. Transfer the brownie mixture to large piece of parchment paper lined cake pan and shape and press firmly and tightly into a 6 to 7-inch square, or thereabouts, that is roughly ½-inch thick. Chill in the refrigerator for about 30 minutes before cutting. 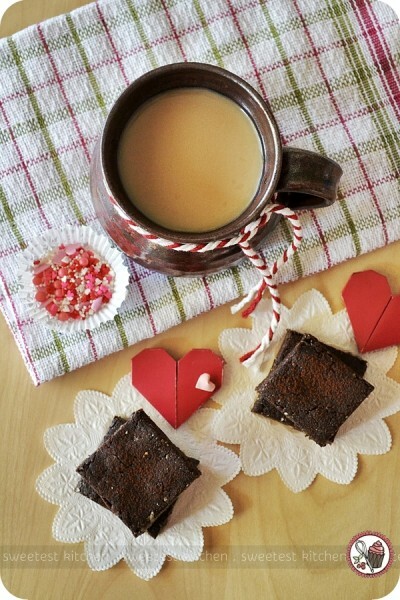 Store brownies in the refrigerator for up to 2 weeks, or freeze for up to 2 months. mmm i could definitely go for a brownie or two right about now! These look amazing! You are becoming the raw treat queen, Jamie!